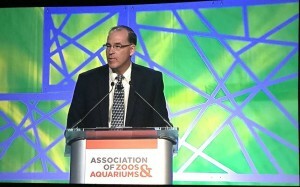 Silver Spring, Maryland (October 6, 2015) –The Association of Zoos and Aquariums (AZA) is announcing the swearing-in of Steve Burns, Director of Zoo Boise, as the new Chair of the AZA Board of Directors. “I am honored to serve as the Chair of the AZA Board of Directors. I look forward to working with all AZA members to help save species from extinction,” said Burns.